Pull the lever to change to the "night" antidazzle position. 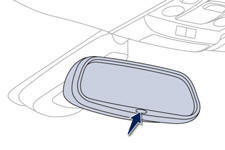 As a safety measure, the mirrors should be adjusted to reduce the "blind spot". By means of a sensor, which measures the light from the rear of the vehicle, this system automatically and progressively changes between the day and night uses. In order to ensure optimum visibility during your manoeuvres, the mirror lightens automatically when reverse gear is engaged.